Actors Michael B. Jordan, Oscar Isaac and Regina King and directors Ryan Coogler and Cary Joji Fukunaga are among the record 683 people who will be invited to join the Academy of Motion Picture Arts and Sciences as part of the largest and most diverse class of new invitees ever. The list of names invited to join was released on Wednesday by the Academy, after the Board of Governors met on Tuesday night to review and vote on the slates of prospective new members submitted by committees from each of the Academy’s 17 branches. Other actors invited to join the Academy include Anthony Anderson, Adam Beach, Kate Beckinsale, Chadwick Boseman, John Boyega, Carmen Ejogo, Idris Elba, America Ferrera, Greta Gerwig, Carla Gugino, Luis Guzman, Tom Hiddleston, Dakoka Johnson, Patti LuPone, Rachel McAdams, Nate Parker, Anika Noni Rose, Emma Watson and Marlon Wayans. The roster of new invitees also includes this year’s supporting actor and actress winners, Mark Rylance and Alicia Vikander, and this year’s Best Actress winner, Brie Larson. 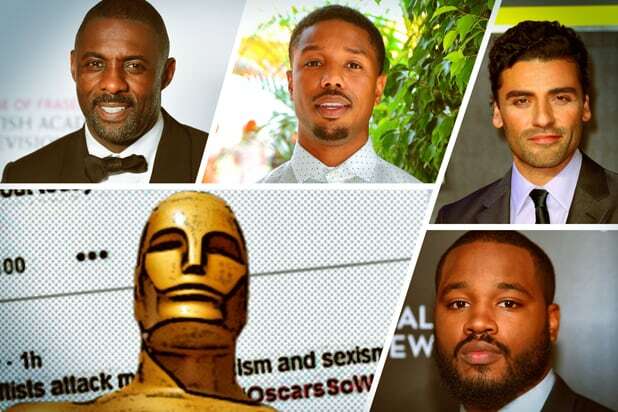 Also Read: Will Academy's #OscarsSoWhite Makeover Begin With New Election, Board Meeting? Directors on the list include Lenny Abrahamson, Scott Cooper, Jonathan Dayton and Valerie Faris, Adam McKay, Melvis Van Peebles and a number of noted international directors, including Haifaa al-Mansour, Ramin Bahrani, Catherine Breillat, Nuri Bilge Ceylan, Xavier Dolan, Deniz Gamze Erguven, Ciro Guerra, Mia Hansen-Love, Hou Hsiao-Hsien, Naomi Kawase, Abdellatif Kechiche, Tobias Lindholm, Ken Loach, Deepa Mehta, Cristian Mungiu, Laszlo Nemes, Park Chan-wook, Nicolas Winding Refn, Apichatpong Weerasethakul and Maren Ade, whose “Toni Erdmann” was the critical hit of Cannes this year. Lana and Lilly Wachowski, the transgender sisters who made “The Matrix” as men, were also invited. The Directors Branch issued 91 invitations, most of any branch. The Short Films and Feature Animation Branch was second with 88, followed by the Actors Branch (the Academy’s largest branch) with 69. The list of new members, by far the largest the Academy has ever announced, includes 283 new international members from 59 countries. According to figures released by the Academy, 46 percent of the new invitees are women and 41 percent are people of color, far higher percentages than usual. Prior to this year, the largest number of announced invitees was 322 in 2015. The Academy has been releasing the names of those it invites to join for more than a decade, though it does not reveal the rare cases in which a prospective member may decline the invitation. Scrutiny of this year’s invitations is particularly intense, because the Academy has made a point of trying to change the makeup of an organization that is about 90 percent white and 75 percent male. In January, responding to the #OscarsSoWhite controversy caused by two consecutive years of all-white acting nominees, the board voted unanimously to adopt a series of changes to meet the stated goal of doubling the number of diverse members by 2020. Doubling the number of “diverse members” by 2020 will probably entail adding at least 500 minority-race members and 1,500 female members over the next five years. In recent years, the number of women invited to join the Academy has ranged from 20 to 30 percent, with the number of minority invitees typically falling under 15 percent. Last year, less than a third of the invitations went to women or non-whites. As of December 2015, when the voting rolls were prepared for the 88th Academy Awards, AMPAS had 7,152 total members, of which 6,261 were active, voting members. Each branch sets its own requirements for membership, ranging from a minimum number of screen credits to a certain number of years of continuous work in the field. Also Read: What Does It Take to Vote for the Oscars? The Academy’s 17 branches are currently examining their membership rolls to determine if any members are inactive to the degree that they should be transferred to emeritus, non-voting status. The number of members who will lose voting privileges is expected to be small. Here is the complete list of potential new members. Note: An asterisk indicates a member who was invited to join more than one branch. That member must choose a single branch to join. Among the surprises, milestones and rare moments at the 88th Academy Awards was one first that actually wasn't a first. The 2016 Oscars were a "Spotlight" sandwich, opening the night with an original screenplay win before going silent for the rest of the night until its big Best Picture victory. "Spotlight" is the first Best Picture winner to bag less than three Oscars since "The Greatest Show On Earth" in 1953. The film with the biggest haul was "Mad Max: Fury Road." While it didn't win Best Picture or Director, it did come away with six Oscars in the technical categories. There's another wildly popular film that had the same results on Oscar night: 1977's "Star Wars." The big victory for "Mad Max" also made it the most decorated Australian film in Oscar history, doubling the three Oscars won in 1993 by the previous record holder, "The Piano." There was no way "Star Wars: The Force Awakens" wasn't going to have a presence at this show. C-3PO and R2-D2 came onstage with their new droid brother BB-8 to honor John Williams for his 50th Oscar nomination. He has the most nominations of any living person in any category. Walt Disney holds the all-time record with 59. One pleasant surprise was the Best VFX win for "Ex Machina." With a budget of $15 million, it's the cheapest film to win in this category since "Alien" in 1979. It also beat out three Best Picture nominees, something that hasn't happened in this category since "Tora! Tora! Tora!" beat Best Picture winner "Patton" in 1971. "Bear Story" is now the toast of Chile after becoming the first film from that country to win an Oscar with its Best Animated Short victory. Director Gabriel Osorio and producer Pato Escala Pierart join "Life of Pi" cinematographer Claudio Miranda as the only Chilean-born Oscar winners. Parties were thrown in Mexico City for "The Revenant" and the Oscar wins for Alejandro G. Inarritu and Emmanuel Lubezki. Inarritu now has four Oscars and is the first back-to-back Best Director winner in 65 years, joining John Ford and Joseph Mankiewicz. Lubezki, meanwhile, has an Oscar dynasty with three straight cinematography awards. Actors take note: if you want an Oscar, consider working on a Tom Hooper film. Alicia Vikander's win makes "The Danish Girl" the third straight Hooper film to get an acting Oscar, joining Anne Hathaway for "Les Miserables" and Colin Firth for "The King's Speech." It's strange to say it considering he is such a legendary film music composer, but "The Hateful Eight" is Ennio Morricone's first Oscar win. He was given a lifetime achievement award by the Academy in 2007, but this is his first Oscar win in competition after six nominations, having previously been nominated for classics like "Days of Heaven" and "The Mission." At 87, he is the oldest Oscar winner of all time. No, Sam Smith was not the first openly gay Oscar winner ever. He wasn't even the first in his category. That goes to late composer Howard Ashman, who won for co-writing "Under the Sea" from "The Little Mermaid" and the theme from "Beauty and the Beast." 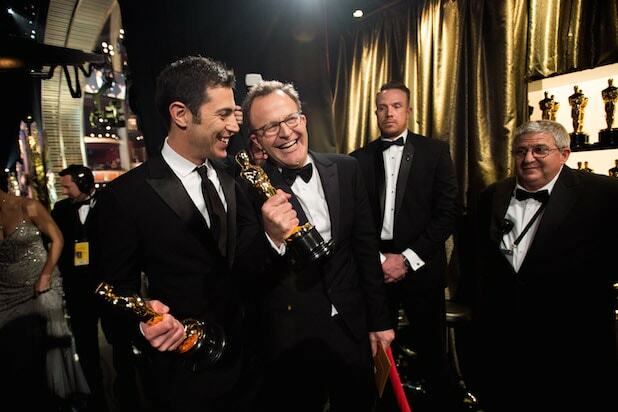 Other gay winners include Elton John, Pedro Almodovar and Joel Grey. Will Academy’s #OscarsSoWhite Makeover Begin With New Election, Board Meeting? After the Oscars: What Now, Academy?